With the overwhelming ratification of a contract covering 1,500 NYSNA members at Westchester Medical Center (WMC) on January 4, our union continues its winning streak. It is an outstanding record of achievement. Add to the WMC win this year: contracts at Long Island’s Catholic Health System (St. Joseph, St. Charles and St. Catherine of Siena hospitals); St. John’s Riverside in Yonkers; at Nathan Littauer Hospital in Gloversville; St. Elizabeth in Utica and Samaritan in Watertown, in the North Country: Elizabethtown, Moses Luddington, and Alice Hyde Medical Center. And in New Jersey, at Shore Medical Center in Somers Point. 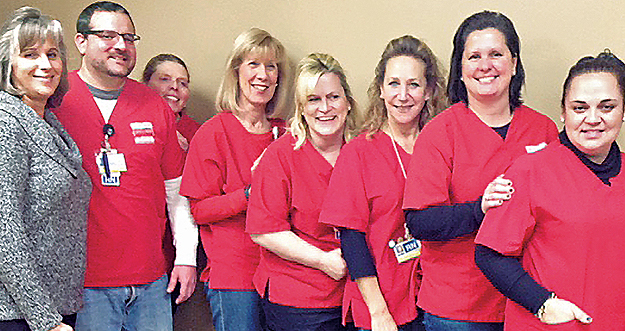 These winning contract fights entailed rank and file members stepping up — from all departments, all shifts — and working together in committed and systematic ways. They worked with LBU leadership and negotiating committees; they huddled with NYSNA staff; and they strategized with NYSNA leadership. In each instance, these were coordinated campaigns comprised of community outreach, sometimes at town halls and other times in door-to-door efforts. Nurses engaged the press, speaking in forthright terms and with the confidence their professionalism inspires. Drawing on ties to other unions and with regular contacts with elected officials on city, county and state levels, rallies and meetings often drew in these supporters. (Left) St. Elizabeth RNs Ashley Ross and Joanne Campbell on March 18. 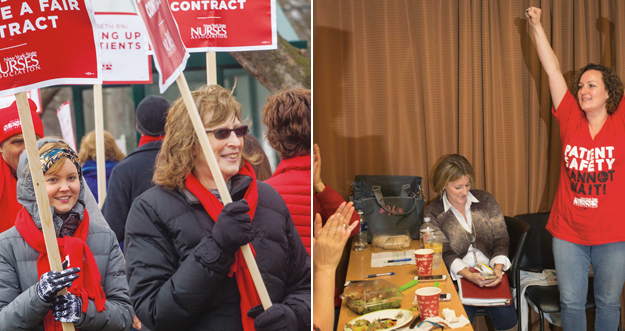 (Right) Westchester Medical Center nurses celebrate as winning ratification vote is announced on January 4, 2017. Brave and forthright, NYSNA nurses have shown an extraordinary level of determination and unity. In each contract fight, nurses have underscored their role as patient advocates and have called clear and strong for safe staffing provisions. Safe staffing saves lives! More than wages, benefits or other provisions, nurses are persistent in demanding contracts that ensure safe staffing and quality care for all patients. NYSNA stands for equality and our contract demands reflect that fundamental principle: all patients at all hospitals deserve a high standard of quality care. The power to stand up for this principle starts in every unit, at every meeting, digging deeper to find ways to stand in solidarity for our patients, families and communities.